Opponents to a controversial scheme to dump mud from a nuclear plant off the coast of Cardiff have launched a last-minute legal challenge. 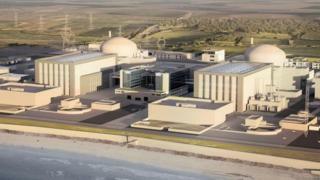 About 300,000 tonnes will be dredged from the seabed near the Hinkley Point C building site in Somerset. The Campaign Against Hinkley Mud Dumping submitted an application to the High Court in Cardiff on Monday seeking an interim injunction. However, a barge made its first trip to dump mud on Monday evening. Hundreds so far have protested against the plan. Campaigners have argued Natural Resources Wales (NRW) failed to carry out an Environmental Impact Assessment and said core samples were insufficient under international rules and did not cover all significant radioactive substances from the Hinkley plant. Super Furry Animals keyboard player Cian Ciaran, who submitted the legal challenge, said: "I have one simple argument - absence of evidence is not the evidence of absence, therefore, the precautionary principle should dictate a re-think." Developer EDF began moving mud and sediment to Cardiff Grounds, a licensed disposal site a mile out to sea off Cardiff Bay, on Monday evening. The barge, called the Sloeber, spent about half an hour off the coast of Cardiff before heading back down the Bristol Channel to Hinkley. Energy firm EDF, which is behind the £19.6bn plan to build Hinkley Point C, and NRW insist the mud has been fully tested to internationally agreed standards. EDF said it was "typical of sediment found anywhere in the Bristol Channel and no different to sediment already at the Cardiff Grounds site". NRW said independent experts examined results taken from the power plant construction site and found the chemical and radiological results were within "acceptable, safe limits". Max Wallis, of Friends of the Earth Barry & Penarth said: "We believe that the decision to grant the Marine Licence is unlawful and have therefore taken steps to take legal action to stop the operation." The Welsh Government said NRW made its decision based on "expert advice". It also concluded the material was within "safe limits" and posed no "radiological risk" to human health or the environment.